Much like Trask, my Gen Con 2016 was a great experience! The issues were minor, the fun was major, and the logistics went smoothly. My gaming calendar differed from Trask’s enough that I can add some unique commentary. Without further ado, here is my perspective. Today’s post is covering Wednesday and Thursday. This year, I did something I have not done in a long time. 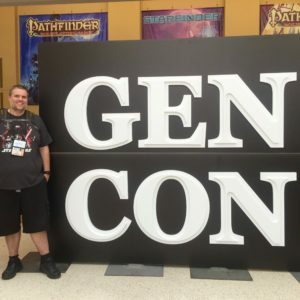 I was a Game Master at Gen Con. Gen Con, in recent years, as been all about playing loved games, and playing new games. I GM in my normal gamer life all the time. I made Gen Con a time to relax in the players seat. This year was different. Over the past few years, I fell in love with the Cypher System, in all its forms. It has made my GM life so much easier. I no longer find GMing a labor of love. Now, it is just a love. I signed up to run two games of Numenera (more on that later) without worry that it would drag down my Gen Con experience. Wednesday night brought the Monte Cook Games (MCG) GM Meeting. The process was straight forward. The GMs got together and we had a short briefing on the operational process. Then there was a Q&A period to ask questions. From here, the whole experience took off. First, all the GM materials were well organized. Each GM received a packet. It contained character sheets, tent cards, coupons, and event ticket envelopes for their events. The materials were sorted and tagged with the GMs name. It struck a harmonic chord on my organizational heartstrings. Second, MCG was very generous. 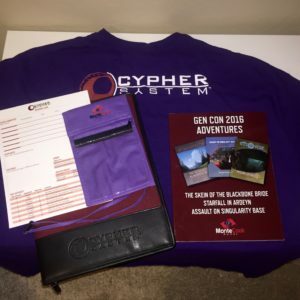 All the GMs received T-shirts, badge holders, and a printed book. That book had all the adventures running at the convention. This was especially great, as it is something I can use to run these adventures elsewhere. Since I was running two events, I received a Cypher System portfolio case and a laminated GM card. And those who ran four events received a free convention badge. Third, the entire MCG team popped in to thank us and answer questions about the adventures they wrote. They also hung around afterwards for a GM social. I have never had such a supporting and thankful experience being a GM. I am not saying other companies aren’t on par, but I was involved with many who were not. I will be GMing for MCG at Gen Con again. I love Cosmic Patrol. Gen Con is the only place I have had the opportunity to play it, and I try to play it every year. This year, I tried something ambitious. I was able to get tickets to all four parts of the mission storyline, in order! I ended up attending three of the four events (more on that later), and all three were on Thursday. 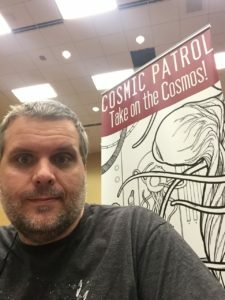 For those who are not familiar, Cosmic Patrol is a beer & pretzels RPG. It is a GM-less narrative system. The genre is 1950s pulp Science Fiction. Rocket ships and ray guns, baby! Players take turns narrating the story, changing it with the actions of their characters. Thus, the excitement of Cosmic Patrol directly relates to the creativity of the players. I experienced the highs and the lows of this relationship. One group was a fantastic, high adventure, thrilling game. One group used it’s Plots Points (significant alterations to narration) to bypass any threat. This left the story flat, and unexciting. But, the game is still great. That is just the danger of playing a human-dependent game with strangers. I will look for it again next year. Though, maybe not four slots worth. I had one other game on Thursday. It was originally going to be the ‘A Song of Ice and Fire’ RPG, a system I have been trying to attend for many years. But, I canceled it in lieu of the game I ended up playing. But no worries, the Gen Con Gods had shined on me this year, and I had another ASOIAF game scheduled for Sunday. So, I would get to play it anyway, right? Stay tuned. The game I played on Thursday was one of the best gaming experiences of my life. Herolab to Support Paizo Pathfinder! July 19, 2008 trask Comments Off on Herolab to Support Paizo Pathfinder!